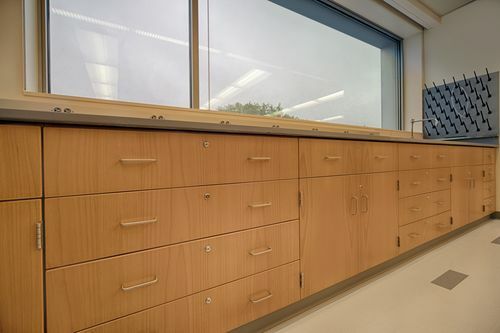 Premium reveal overlay MDF casework that offers an alternative “green friendly” approach to construction. This casework is a wonderful alternative that does not require the use of expensive veneers, plastic laminate materials or painted metal. Medium Density Fiber board is a listed AWI Premium substrate that can be finished “raw” to provide a stained or painted aesthetic. The result is a unique installation that incorporates the construction methods called out in AWI, but is engineered and fabricated with a cost savings that can be beneficial for any institutional project.